Tremendously popular and widely consumed, chocolate is an essential ingredient on any respectable dessert menu. But with almost all restaurants offering at least one chocolate dessert at any given time, chefs are getting creative by applying innovative, on-trend tweaks to classics. “Brownies are delicious, but sometimes just come across as plain Jane,” said Jared Hills, executive chef at Hello Betty in Oceanside, Calif.
To spice it up, he serves a Mexican chocolate brownie spiked with ancho chile and cinnamon, served with dulce de leche ice cream, hot fudge, candied pepitas and whipped cream. 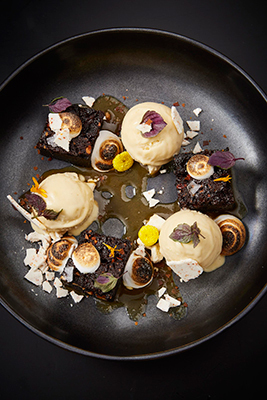 On the menu since the restaurant opened in 2014, the south-of-the-border-inspired brownie is among the restaurant’s top-selling desserts. “Adding a little spice to the dish just seemed natural, especially this close to the border,” Hills said. 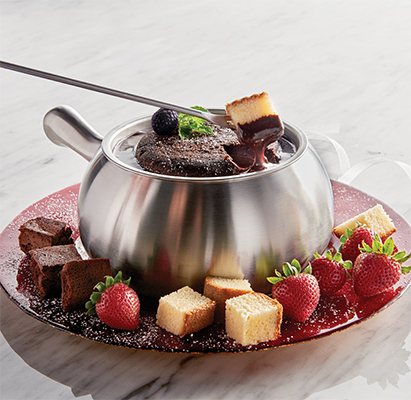 Two culinary classics — molten lava cake and chocolate fondue — collide in the new Blackberry Crush Chocolate Fondue at Tampa, Fla.-based fondue chain The Melting Pot. Added to the 125-unit chain’s menu in September, the new dessert features a dense chocolate genoise cake infused with Merlot that seals the top of a pot filled with blackberry-chocolate fondue. The dessert is finished with berries, a mint sprig, and a dusting of powdered sugar, and is served with fruit for dipping. The milk chocolate crème brûlée at Urban Farmer in Philadelphia makes for a classic modern dessert with the addition of a winter citrus salad of cara cara and blood oranges. Meanwhile, some chefs aren’t adding ingredients to their chocolate desserts, but rather taking one out: Gluten. At 16-unit Phoenix-based True Food Kitchen, where chocolate is part of the anti-inflammatory food pyramid, the dessert menu includes a flourless chocolate cake served with a side of warm caramel sauce and cocoa nibs, topped with a scoop of dairy-free vanilla “ice cream” made with coconut cream and rice milk. At Departure, a pan-Asian restaurant in Denver, pastry chef Erin Koroll offers an entire menu of gluten- and dairy-free desserts, including a dark chocolate brownie cake. It’s a simple recipe, Koroll said, but it produces a brownie that can rival a standard take.